GROW A HAPPIER GARDEN – Do you look at other’s gardens with envy? Give your plants the nutrient-dense fertilizer they crave, and watch your garden bloom like never before! With Miracle-Gro’s large dual chamber, heavy-duty rotating tumbling composter you get 2 compartments for faster and more efficient composting all year round. KEEP THE NUTRIENTS COMING – Achieve your gardening goals with a steady supply of ready-to-use compost! This 2-chamber compost tumbler allows you to add compost ingredients to 1 side, while waiting for the other side to cure. And with internal mixing bars that speed up the decomposition process, you can expect rich, fertile compost in just 4-6 weeks! NO MORE HEAVY LIFTING – Miracle-Gro is here to make composting easy for beginners and seasoned green thumbs alike! Our efficient tumbler system is the simple way to get perfectly cooked compost without having to dig, turn, and mix by hand. All you have to do is open the easy-sliding door, add your scraps to the bucket, and turn the handle 5-6 times every few days. Don’t let small spaces keep you from always having fresh compost on hand! Typical composters are clunky and cumbersome, but Miracle-Gro’s Small Dual Chamber Composter is just the right size for tight spaces. Generate a constant source of compost from just about anywhere! Cure compost in 1 chamber while you add scraps to the other for a steady supply of ready-to-use compost. Simply load your kitchen and yard waste into 1 side, close the sliding door, and use the built-in handle to give it a few turns every few days. The internal mixing bars create an efficient aeration system to speed up the composting process, to produce finished compost in weeks! Heavy-duty durability for year round composting! Get a compost tumbler you can depend on for the long run. Miracle-Gro uses BPA free, UV protected, recycled polypropylene. Not only does it hold up under intense sunlight, but it’ll never leach harmful toxins into your valuable compost. And the galvanized steel frame is corrosion-resistant, so your composter can stay outdoors in rain, snow, heat, or cold. Assembled size: 25.6 x 32.3 x 23.6 inches. Composting shouldn’t be a struggle, but most composters on the market make it anything but simple. Fortunately, Miracle-Gro’s dual-chamber tumbler is here to make composting a breeze! 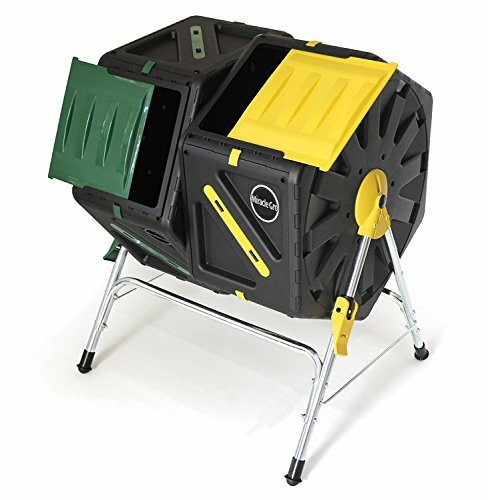 Loading and unloading the compost chambers is effortless with the rolling barrel design and easy-to-grip handles, making it suitable for gardeners of any age or experience level. Accomplish any chore, big or small with a FREE pair of Scotts water-resistant gardening gloves! For a limited time, your purchase includes a FREE pair or latex-free gloves. Tackle any task with 2 of the most trusted names in gardening by your side. Turn your kitchen scraps into garden goodness and add a compost tumbler to your cart TODAY! 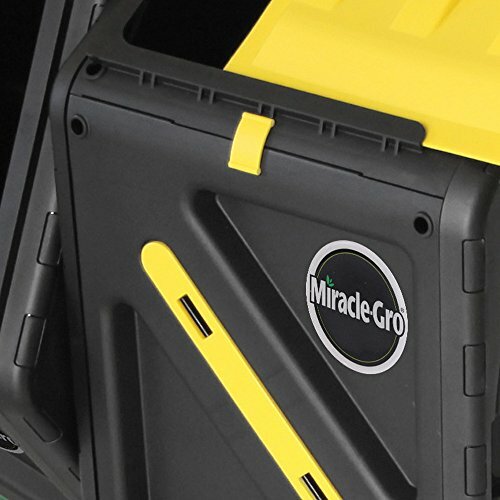 A BRAND YOU TRUST – With the help of Miracle-Gro, both you and your garden will thrive. As America’s most trusted garden supply brand, we guarantee you’ll be satisfied with our products. Once you start using the compost generated by your new dual-chamber best tumbling composter, you’ll enjoy bigger harvests, healthier plants, and your most beautiful gardens yet! FREE BONUS GIFT – Achieve your garden goals with a FREE pair of Scotts multi-purpose gardening gloves! 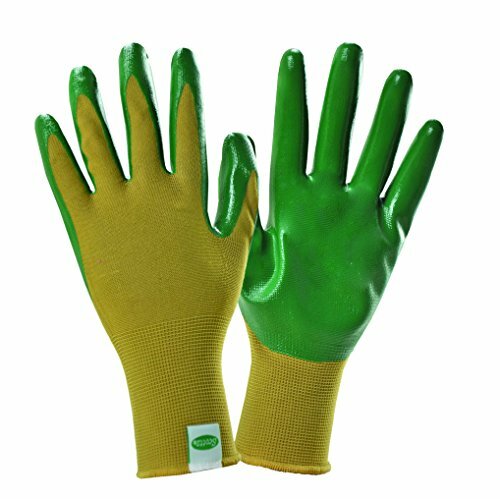 Each pair is latex-free, water-resistant, and features a no-slip grip, perfect for both indoor and outdoor projects. Grow your green thumb with Scotts and Miracle-Gro!